It’s after 5 o’clock in Bryce Canyon National Park. It’s 45 degrees and drizzling. Mt girlfriend and I are finishing up an 8 mile loop touring the canyon floor. We're just starting a long ascent up switchbacks to the rim where we parked our car. I’ve been keeping an eye on the black clouds approaching from the east. They're moving fast, but we should just beat it to the car if we keep a good pace. A group of 4 college aged tourists pop out from around a bend and are heading towards us on the trail. The 3 boys are walking quietly with their heads down and arms close to their bodies, trying to hide the fact that they are freezing, probably to impress the girl that they’re with. They’re wearing jeans, t-shirts and a lot of ridiculous silver chains around their necks. I can tell that they’re almost definitely European from their stonewashed jeans. They look like they could be the spoiled grand kids of a Ukrainian diplomat, a Czech pop band, a Polish swim team, or something akin to that. “That big storm is going to hit really soon. Do you guys have jackets, “I ask? They don’t acknowledge me and they keep on walking past us down the hill into the canyon. Fifteen minutes pass. The rain hits just as we can see the rim. The temperature drops ten degrees, the canyon goes completely dark and the rain is so intense that we have to wait in the car for a half hour before we can even leave the parking lot. We watch for them, expecting them any minute, but the Ukrainians never come back up the trail. 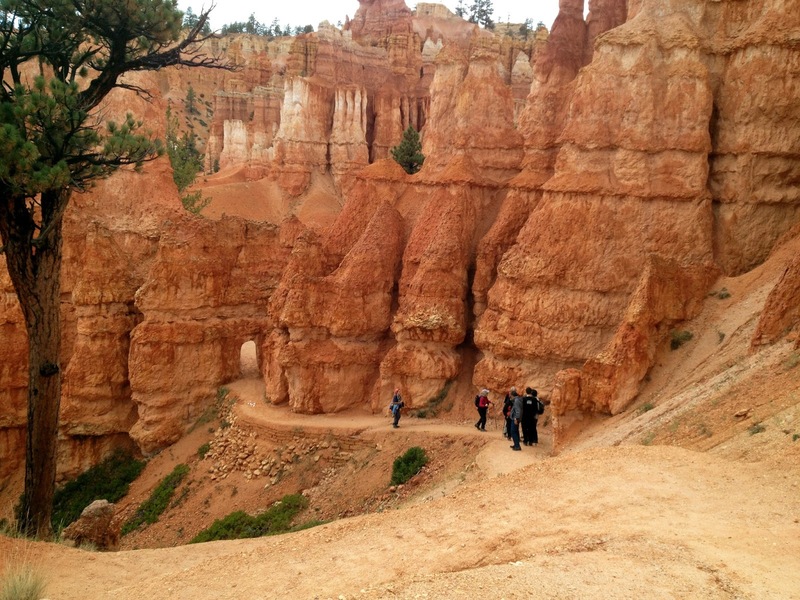 I would love to read their Yelp review of Bryce Canyon. 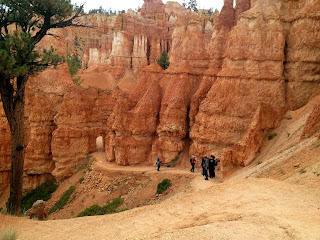 Bryce Canyon National Park is one of the most beautiful parks in the United States. 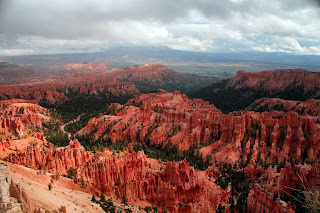 Although it’s located only 80 miles from Zion National Park, Bryce gets only a fraction of the number of visitors. I suspect the lack of crowds are due to the fact that Bryce is in a remote area with no major cities or highways close by. We stayed west of the park in two small towns, Panguitch and Hatch. 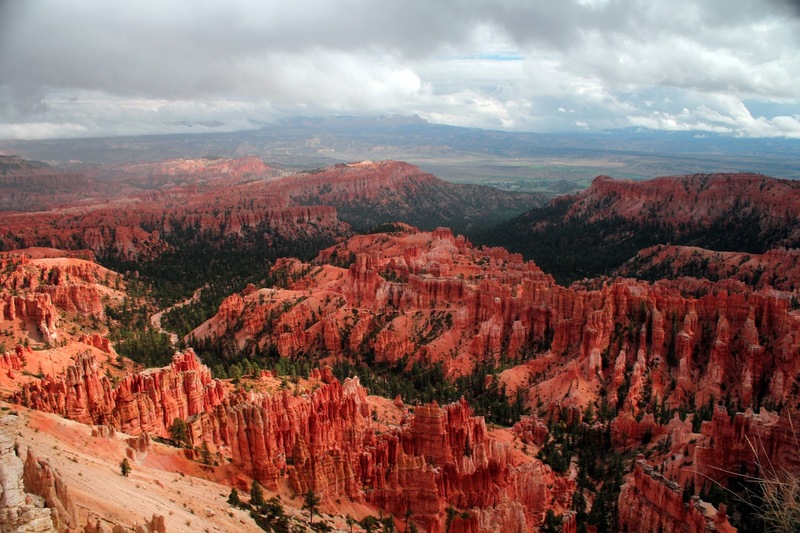 If you’re looking for luxury on your trip to Bryce, you won’t find it in either of these towns. The best you can hope for is clean roadside motel to sleep in and a diner where the flies won’t swarm you. 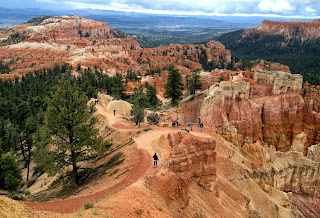 Bryce Canyon National Park is situated at an elevation above 8,000 feet and the temperatures are much cooler than Zion. Where Zion might see sun and fall temperatures in the 80’s, it may be in the 40’s and raining in Bryce in October like we experienced. We had planned to camp, but torrential evening storms and nighttime lows in the 30’s forced us to stay in motels outside the park. 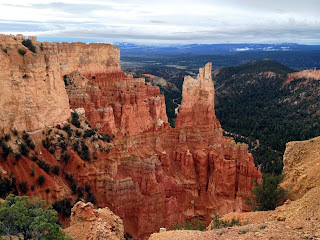 We spent 2 days in Bryce hiking 4 major trails in the Amphitheater Section and another day driving between the overlooks and only briefly exploring the rest of the park. I could easily have spent several more days in the Amphitheater exploring every nook. The Queen’s Garden trail easily ranks among the best trails I’ve ever hiked. You begin the Queen’s Garden trail at the Sunset Overlook with a vast view that spans the entire canyon and at least 20 miles beyond. 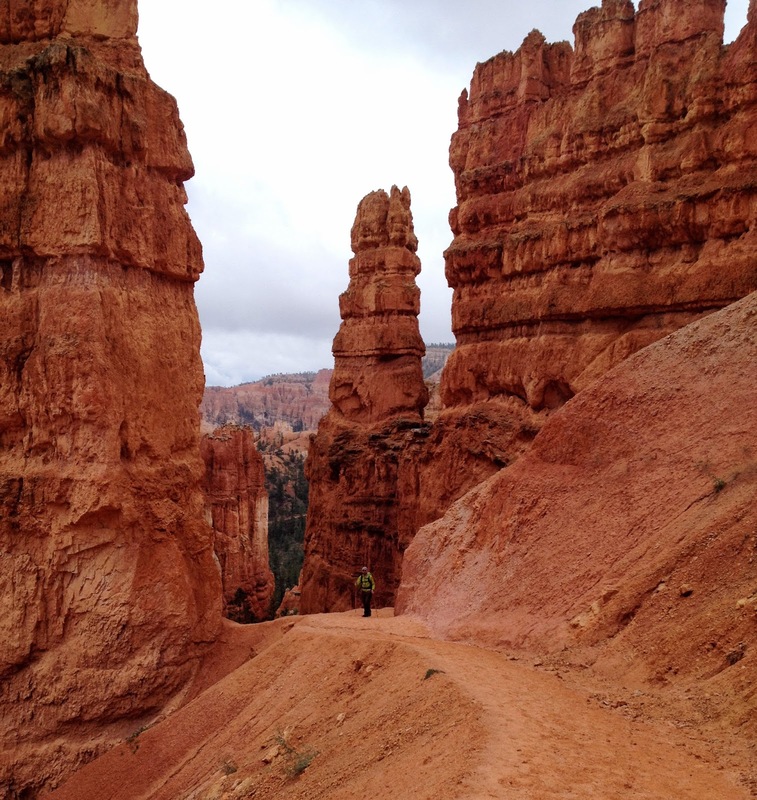 You’ll hike several hundred feet down among the giant spires and hoodoos. The scenery completely changes around every bend in the trail. You pass under several man-made arches as you hike the trail. Once you reach the valley floor, you weave through a maze of trees, slots, copper colored rock walls and giant, precariously balanced rock formations that look as though they could come crashing down on you at any second. You can take as many photos as you want, but they won’t do the trail any justice. You have to see it to believe it. The return trip up is actually pretty moderate no matter which direction you travel. We saw several young children on the trail who were handling the ascent with no trouble at all. The loop is approximately 6 miles. We finished it in a little over 2 hours with several stops for photos. 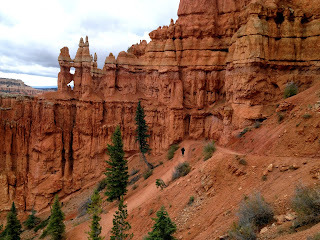 The next trail we hit in Bryce was the Peekaboo Loop. 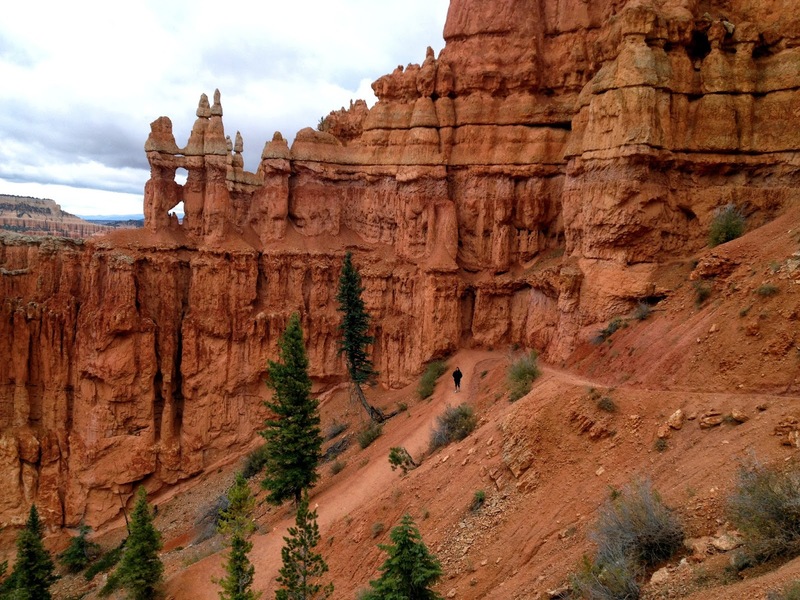 The trail starts at the Bryce Point Overlook. You descend for approximately one mile into the canyon until you hit the actual loop. You’ll ascend and then descend several times on the 4 mile loop through the canyon, passing overlooks, rock shelters, small arches and rock formations all along the way. This trail is a bit more strenuous than the Queen's Garden. The Peekaboo Loop is absolutely stunning, but you’ll have to share it with the horses and donkeys and a lot of the trail smelled like horse piss. Maybe when I’m older, I’ll appreciate the need for a horse so that I can visit the park without having to walk, but I really felt like the stench and piles of manure on trail detracted from the natural beauty. I don’t think I would hike this trail again during tourist season because the stench was a real nuisance. I regret not hitting the Fairyland Loop instead where horses weren't allowed. 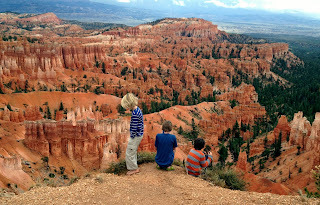 Where to Stay In Bryce Canyon National Park. There are several options nearby for camping. Dixie National Forest is located just north of the park and there are plenty of free places to camp a few miles off Route 12, especially near Red Canyon. This website has a detailed list of free campgrounds near Bryce with directions and GPS coordinates. If you prefer a cheap motel, I would recommend checking Hatch or Panguitch. For something a little nicer, check the town of Tropic. 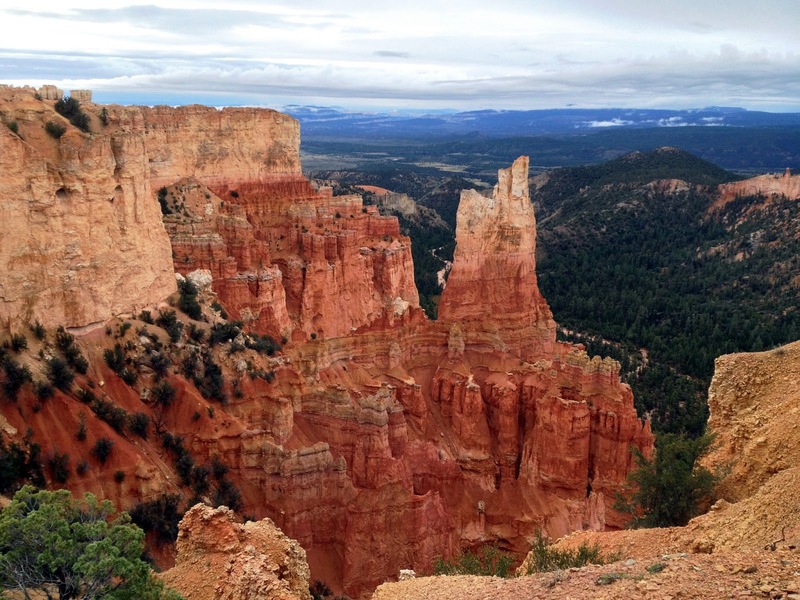 There are 2 campgrounds within Bryce Canyon NP, Sunset and North both are located right next to the visitor’s center. They were completely devoid of tents when we visited in October, but I’m sure they fill in the summer. These campgrounds are located at over 8,000 feet of elevation and they can be brutally, dangerously cold in the winter at night. The park is serviced by a free shuttle that runs from late April to September. The rest of the year, you’re on your own. There are 2 or 3 dining options within the park, but you’re basically limited to pizza or fine dining in the evening. I suggest bringing a cooler with some food before you hit the park. A few other things you might need in the park would be a rain jacket, firewood for camping, headlamp, gloves and a warm hat.